I’ve been comfortably ‘out’ to close friends and family for a while now, but I’m going to use this space to publicly announce that I am, in fact, an amateur vexillologist. To the layman, that means I have a passing fancy for (read: obsessive quiz addiction to) flags. I come out like this to discuss the Australian flag – that one with the Union Jack on the canton, the Commonwealth Star, and the ubiquitous Southern Cross. As preface, I don’t vehemently hate this flag; as a flag-fancier, I appreciate the historical context and weight behind design choices – choosing a symbolic representation for a group of millions of people could never be easy or really wrong. Like haircuts, relief comes with the realisation that change is possible, and permanency is just a state of mind – just ask Afghanistan, which has had 23 different flag designs since 1901. Even though recent research suggests that the Australian flag is regaining popularity of late, and the Abbott government would never entertain the thought of change, with the imminent Scottish Independence referendum about to take place, the Union Jack – the emblem of most contention on our flag – has become endangered. 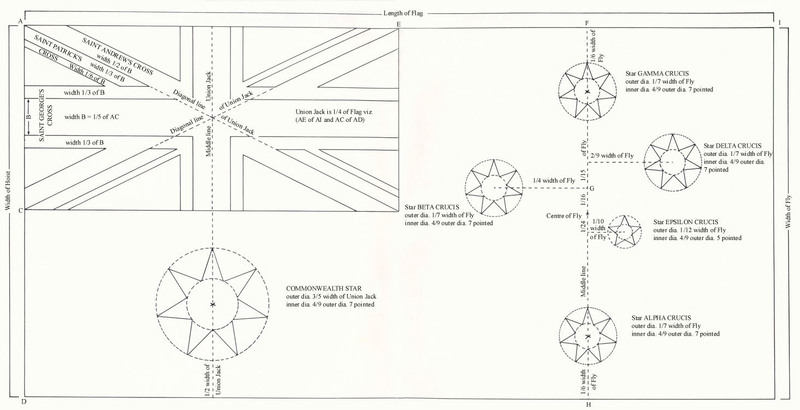 In a fantastic post by design agency, Atelier Works, the history of the Union Jack’s design, and its flaws, are dissected and several post-Scotland alternatives are put forward. For you see, dear layman, the Scottish flag is what gives the Union Jack its blue, and therefore the cohesion between the Australian flag’s canton and its blue background, or ‘field’. If the United Kingdom (which, as the post points out, could be recalled the ‘Former United Kingdom’ if Scotland leaves it) were to change its flag, the ramifications for Australia’s ongoing identity crisis could be forced into mainstream discussion, yet again. We wouldn’t be obligated to change the flag, as Flags Australia has pointed out, but there’d be an obsolete rectangle flapping in the breeze, nonetheless. From an outsiders perspective, the possible flag change in the UK wouldn’t be as emotionally fraught as it would be in Australia, given that England, Wales, and Northern Ireland all have separate flags, parochially loved within those countries: the Union Jack, for the UK, is a forced hand of ‘unitedness’. Similarly, a flag change for New Zealand seems like a no-brainer. Its design confuses everyone, even the Kiwis themselves, and the alternative Silver Fern motif – used for their sporting teams, most notably the All Blacks – is a perfect, easy replacement: its as dynamic and memorable as Canada’s maple leaf, or Japan’s red sun, conveniently involving indigenous identity (an endemic species representing ‘the land of the long, white cloud’). Australia, on the other hand, doesn’t have such symbolic reserve – our sports teams enter Olympic stadiums in green and gold, a shade off the green and yellow of South Africa (and Brazil), and a mystery to most other nations. We have the kangaroo silhouette synonymous with QANTAS, but cringe-worthy for a flag’s focal point, especially when it’s a supermarket meat. There’s also the debate over whether we should abandon a flag generations have fought ‘under’ in wars – but as AusFlag reminds us, we don’t actually fight ‘under’ banners anymore, and when we did, we did under the Union Jack only (um, isn’t that what the ANZAC spirit rejects?) or the UN flag, discretely, lest we were shot at, flying our team colours proudly. Furthermore, there’s not going to be a mass flag-burning ceremony after the change – old and new can co-exist. So, as a banner-buff, I want to analyse several new Australian flag designs that have been suggested in the past 50 years or so and discuss what elements I’d like to see flying on flag posts all over the world. 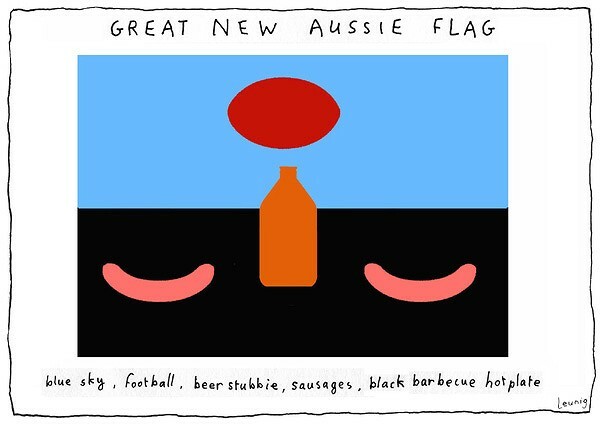 While I admire the intricacies and beauty of flags like Turkmentistan or Sri Lanka, they also reflect the long histories of design in each country, and to have anything too detailed in the Australian flag would seem forced and tacky – imagine a primary school kid colouring in the wrinkles of Barry Humphries’ face, for instance. So the main criterion for my examples below is simplicity. Hahaha, just kidding. This is an old satirical design by Michael Leunig. I’m wary of this choice for a few reasons: first, the Aboriginal flag is a flag for a Peoples rather than a State – it would belie its original purpose and I would think it is a better signifier by itself, not co-opted; secondly, the Torres Strait Islander flag is left out, like Wales is absent from the Union Jack; and thirdly, the colour aesthetic isn’t congruous with flag design (blue and red should never be neighbours). This has been rectified by the above Reconciliation Flag, but while I think indigenous identity should be acknowledged through colour somehow, the Reconciliation Flag is too busy – the eyes drag along it – and a big white line divides the field rather abruptly, signifying a continuing apartheid. Moreover, the left side of the flag looks more like the flag of East Timor than the familiar yellow sun of the Aboriginal one. 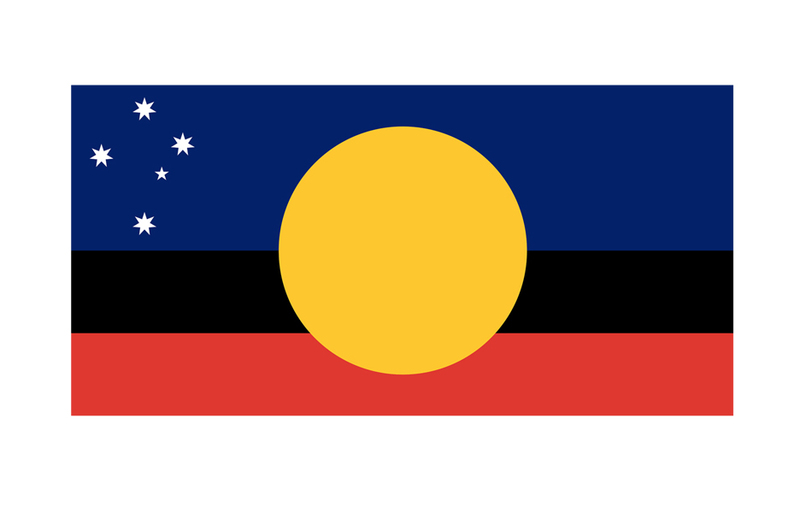 Another design incorporating the Aboriginal flag, keeping the sun and keeping blue and red separate. The Sporting Colours used in a flag design. 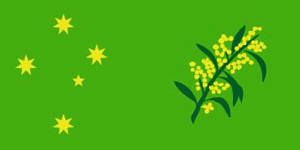 Green and gold is fine for the sporting field of the Boxing Kangaroo, but I think it veers too far away from the current flag to be embraced wholeheartedly by everyone. According to a poll, green and gold outrank the Aboriginal flag colours, but sit well behind the current red, white and blue. Personally, I’m in favour of these colours, particularly blue, which I think is the colour most associated with Australia: the far horizons, the jewel sea; and more blatantly, reminiscent of the current flag that people are so gosh darn proud of. Which brings me to another point: the Southern Cross must stay. Not only to placate those of us (not me!) with Southern Cross tattoos, but to keep the most recognisably Australian motif, even when it’s shared on several other flags. The Southern Cross represents our Antipodean outlook on the world, and constellations in general have an isolated feel to them – a reminder of the country’s sensation of separateness and uniqueness. 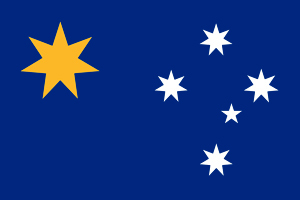 Ken Done’s design turns the Southern Cross on its side (well, technically it has no right-way-up), but to be honest I feel this flag is shouting STAR! STAR! STAR! star STAR! at the viewer. Next! Oh, oh, now that’s better. I like the simplicity of this winning design: the orange-red desert/beach, the white (thank god for the white) horizon/surf stripe, and the big, blue night sky. The Southern Cross is smaller and not dominant, giving the land the continent-sized breadth it deserves. The more I look at this one, the more I’m pulled into a landscape I recognise. But could I picture this on flag poles? Not really. It’s too delicate, almost too forgettable. This is subtle branding, calling for cursive ‘australia‘ written in the corner, said in a breathy voice. 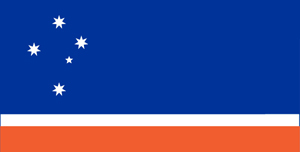 Franck Gentil’s 2000 AusFlag competition winner. The Commonwealth Star. The seven points of this star represent the six states and territories of the nation, and, historically, the uniting of these disparate colonies without war and with relative harmony is a point neutral and far away enough from the European invasion for continued celebration. The yellow symbolises a synthesis of the Aboriginal flag’s sun, with the blue and white so abundant on the current, familiar national banner. The Southern Cross remains on the right, and the empty blue space gives the impression of expansiveness. This design only subtly changes the current one, but renders it powerfully different. The layout of the stars is unlike any other national flag in the world. It’s simple, celebrates indigenous identity, and remains recognisable as Australia. Of course, I’m not 100% sold on this one, but out of the designs floating around, it is probably my diplomatic favourite. It pleases camps on all sides, and that’s more important, to my mind, than getting attached to an aesthetic I think is “pretty”. It’s a shame that über-conservative politicians like Tony Abbott cling onto the Union Jack, with the pretence of historical pride, pointing to gallant war victories/tragedies. But the Union Jack also symbolises a shameful colonial history, and an allegiance to the Crown that keeps this country from taking accountability for itself. It’s like we keep it there to say “we come from something substantial, look!” rather than believing we have grown into our own entity, with values and a culture deviating more and more rapidly from Britishness. We are no longer an outpost. Changing the flag, though superficial, is a rebranding exercise that will need to happen sooner than later if Australia wants to properly enter the World Stage. 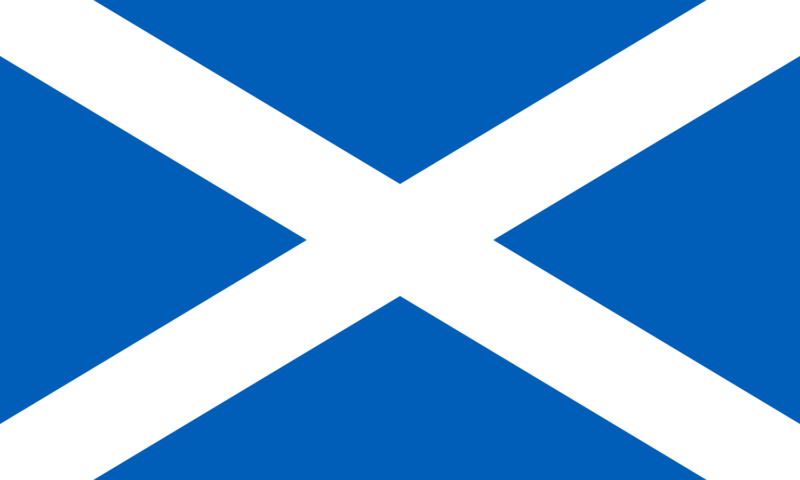 I work with foreigners and the question is always asked: “what’s the deal with the flag, by the way?”; they think that Westminster still controls what happens here. And for someone fascinated by these visual representations of national identity – that’s a frustrating question to answer. Well, that’s all I have to say about this. I’d be very interested to know what other people think. You can read more about the new Australian flag debate and designs here and here.